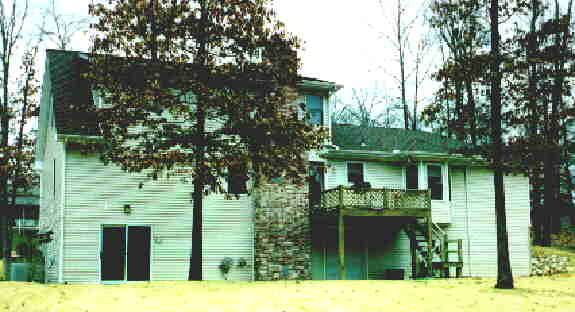 Sliding glass doors to the den, garage door under the deck to the unfinished basement area, deck leads to the main floor living room, bay window to the eat-in breakfast nook. 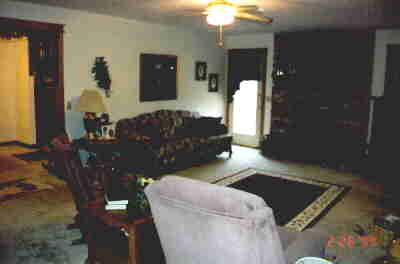 ****Gorgeous**** 3 bedroom, 3 full bath, 2 car garage beauty on a 3/4 acre lot. Beautiful, quiet cul-de-sac in Mallard Point Road area - very close to Norfork Lake. Main floor houses the 17 X 14 master bedroom and bath, living room, formal dining, kitchen, eat-in breakfast area and laundry room. Upper floor houses 2 additional bedrooms with connecting bath. Walk-out basement houses the 13'7 X 17'6 den(or 4th bedroom),9 X 6 office, 3rd bath and 750 sq feet of unfinished storage area with a workroom. 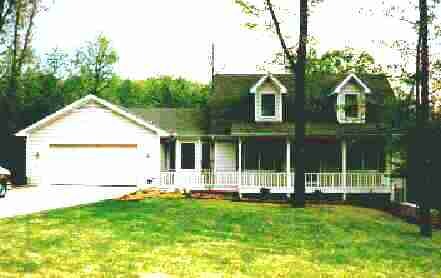 A full garage door opens to the back yard, handy for lawn tractor and tools. Solid oak cabinetry and decorative trim makes this home unique. Neutral carpeting, custom drapes and professional landscaping with Zoysia sod yard. Plumbed for central vacuum. Wood burning fireplace in living room. Approximately 2552 sq. feet not including the unfinished basement area. 2 heat pumps, maintenance-free exterior. This home is a must see! This is the view of the 16'6 X 22' living room from the front door, with the formal dining room to your left. 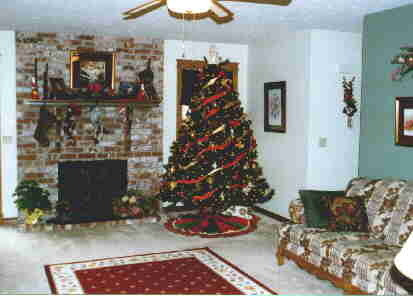 This is the other view of the living room, showing the fireplace and hallway to master bedroom, when the furniture had been rearranged, yet again!. 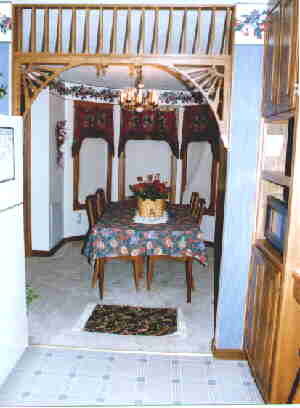 Gorgeous 18'8 X 9'6 kitchen/breakfast nook with solid oak cabinets to ceiling. Dining room is to the right of the stove. This is an older picture - border has been updated. 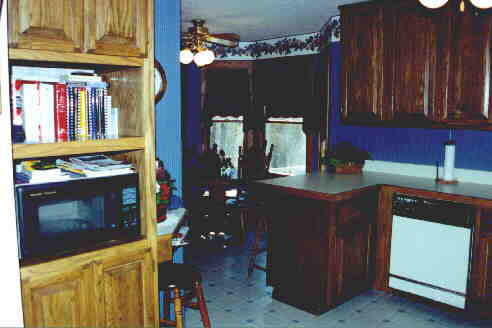 Another view of kitchen - notice the built-in microwave cabinet and corner phone area with barstool. 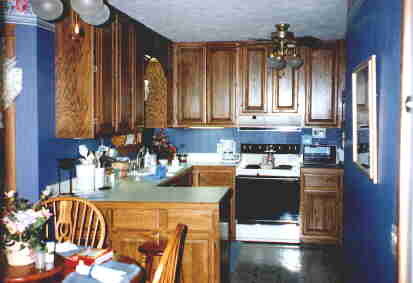 Kitchen cabinets are a medium oak stain - they look different colors in this picture due to shading. Color is accurate in first kitchen picture. 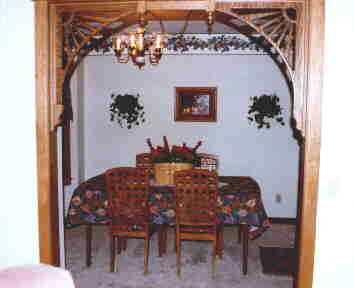 10'8 X 9'5 dining room viewed from kitchen. Bay window with custom curtains. 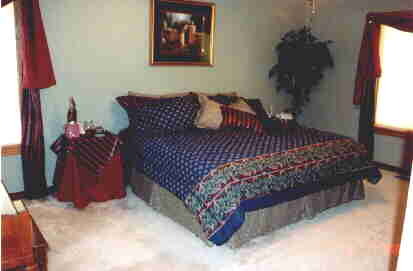 17'3 X 14' Master bedroom with king size bed. 14' X 11'4 Upstairs bedroom. The little door beside the bed leads to a storage area under the dormers - perfect for kids toys! 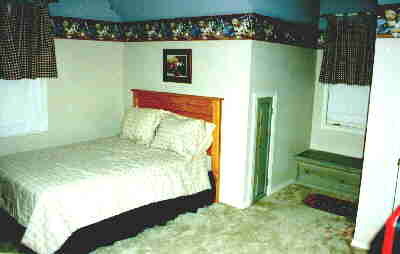 Both bedrooms upstairs have the dormer storage and window seats. 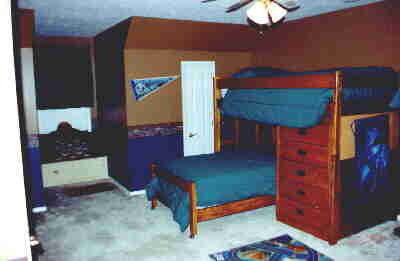 12' X 16'6 Upstairs bedroom. View into the 17' X 14' den downstairs - not all of the room shows in this picture. 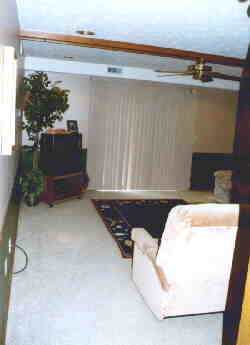 Blinds go to sliding glass doors to backyard. Gingerbreading in this doorway does not show in this picture. View into office - doors you see on your right go to the large closet. 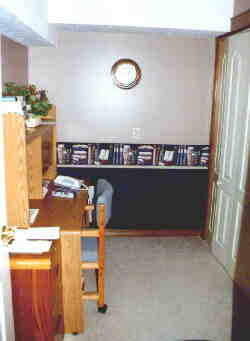 A section of the office does not show - directly to your right as you enter the room, an 8'X 4'2" portion leads to the door to the basement. View of lower floor 3rd full bath - gingerbreading above sink barely shows. 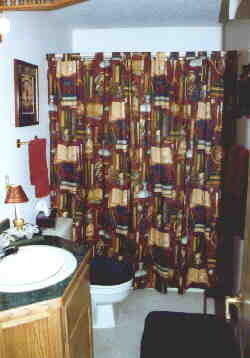 Custom shower curtain remains with home. View up the street (away from the cul-de-sac). Wooded area directly next to the house is currently for sale. 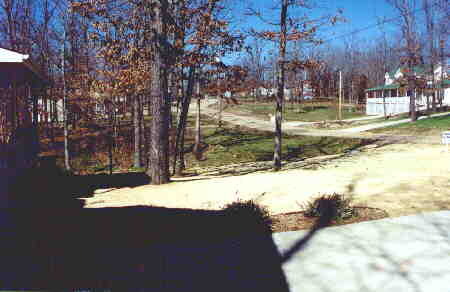 Back Yard - 3/4 Acre Lot. Now playing "Angel Eyes" courtesy of Laura's Christian midis.